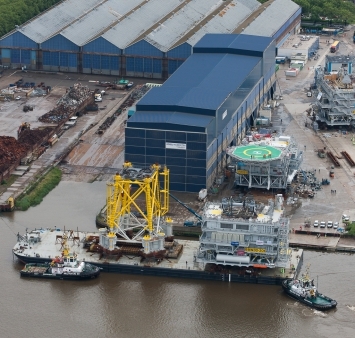 Topside and jacket of the Offshore High Voltage Offshore Substation (OSS) for the Burbo Bank Extension offshore wind farm, have today left ENGIE Fabricom’s Hoboken yard. They will start their journey from Antwerp towards their final destination off the west coast of England. Once more, the consortium ENGIE Fabricom and Iemants contributes to power over 230.000 UK households with renewable energy. Hoboken, Belgium, 15 June 2016 – The consortium of ENGIE Fabricom and Iemants which was contracted by DONG Energy has finalized the fabrication of the OSS and jacket for the Burbo Bank Extension offshore wind farm. They have been shipped out today towards their final destination located on the west coast of England. The jacket and substation will be installed at sea by the end of June. The load-out of the jacket foundation happened earlier this month on the 11th of May at the Smulders yard. 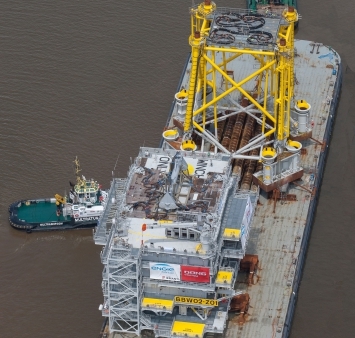 The jacket of 985 tons was transported by the Matador 3 from the dry dock to the Engie Fabricom yard, where it was placed on the transportation barge. On the 30th of May the substation was rolled out and joined the jacket on the barge. The Burbo Bank Extension will be located west of the existing Burbo Bank offshore wind farm in Liverpool Bay, at the entrance to River Mersey. It lies 6.4 km from the Sefton coastline and 7.2 km from North Wirral. The new wind farm will be capable of generating 258 MW of clean, environmentally sustainable electricity. This is enough to power over 230.000 UK homes. The Burbo substation is the first to be completed of the five awarded to the consortium by DONG Energy. ENGIE Fabricom is in charge of the complete fabrication and commissioning on site of the five offshore substations. Iemants is responsible for the steel construction and architecture of the five substations and the jackets. The project started in December 2014 and the last substations are due to commission in 2017. Together, these substations, to be placed in different wind farms located along the UK coastline, will be generating approximately 1500 MW, enough to meet the energy needs of more than one million homes. The four other offshore substations and jacket foundations are still under construction at the yard in Hoboken. The first topside structure for the Race Bank 1 & 2 wind farm (580 MW) will be finalized by end of June and second topside will be ready together with the two substations and jackets for Walney 3 & 4 wind farm (750 MW) which will be commissioned beginning of 2017. It is not the first time that DONG Energy has worked with the ENGIE Fabricom – Iemants consortium: in 2015, they delivered for the same client 2 offshore substations and jackets for the Gode Wind 1 &2 farm. In 2013 the consortium delivered West Duddon Sands and in 2012, they delivered two substations for London Array, of which DONG Energy is shareholder as well.